While doing trip research this week I stumbled across a numerous and very informative post on RideAsia.net: Safety Tips for Riding in SE Asia. As time permits, I'm stocking up on supplies, tools, and stuff for the trip.. I'm also spending some time learning how to take care of getting the bike back on the road if something takes it out. A couple weeks ago, my friend Rick spent some time walking me through changing a tube and tire, replacing brake pads, and changing the oil. I also bought a book that seems to be just what I'll need to help troubleshoot on the road. During the lesson, I realized that the toolkit I carry on the bike is woefully inadequate--I had tire levers (using 3 is easier than only 2), but no 24mm wrench to remove the rear tire, no patch kit, spare tube, or reasonable way to re-inflate the tire. Even with my bicycle pump, can you imagine using this to inflate a motorcycle tire? A little bit of a web search came up with a $30 12V DC compressor that fits in the palm of my hand! 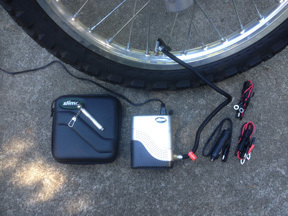 The case shown below on the left holds the compressor, the inflation hose, three different battery connection options, an extension for the power connection, and a small tire gauge (shown sitting on top of the case)—all included in the price. WOW! This would be a GREAT gift for anyone you know who rides a motorcycle, especially if they travel off-road or out of cell phone range! 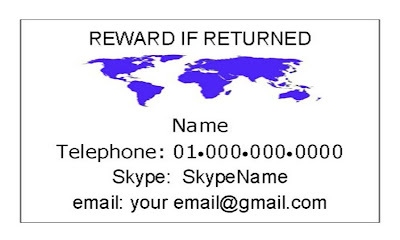 I can only upload images to the blog, so if you send an email to the address shown on the image, I’ll send you a generic version in either a Word doc (.doc) or Rich Text Format (.rtf) in an 8/sheet configuration. Thanks to my friend Huong for the Vietnamese translation! 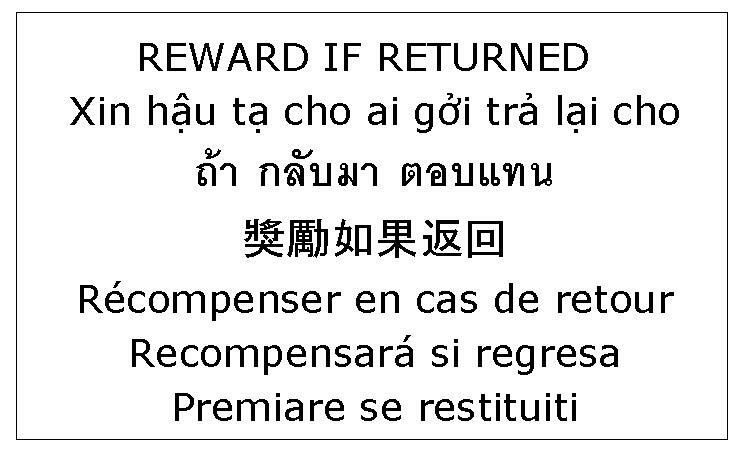 The other languages are the best translations I could find of Thai, Chinese, French, Spanish, and Italian. 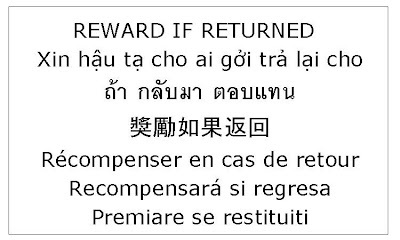 If you can translate “Reward if Returned” into any other language—especially Cambodian, Laotian, or Burmese—or find a needed correction in any of the above, I’d appreciate it if you’d send me the translation. 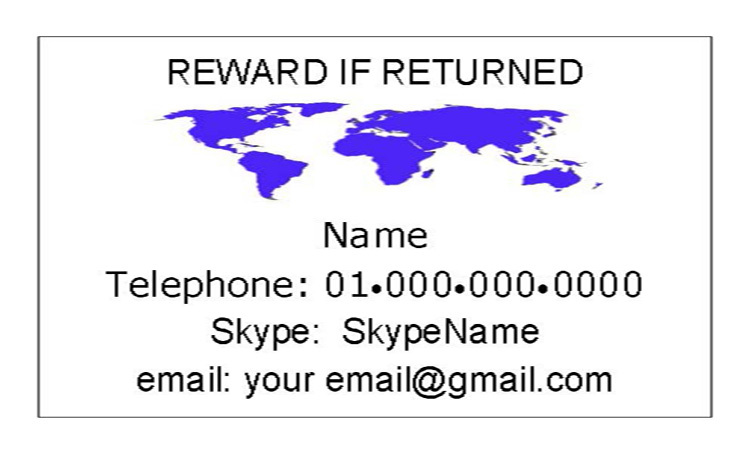 I will publish any I get as they come in so others can use them, too.